Opening hours: Tuesday - Saturday, 11.30am - 5.30pm. 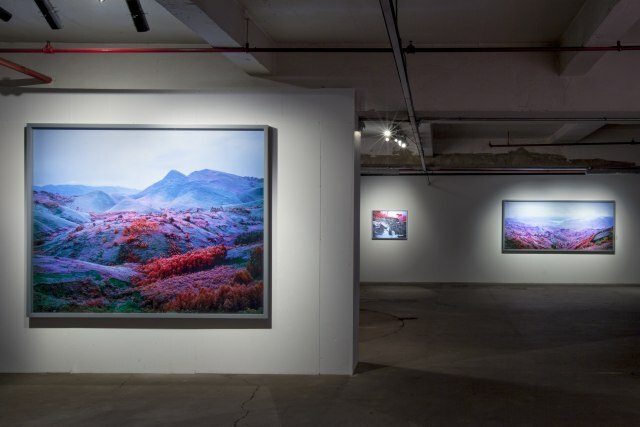 Edel Assanti and The Vinyl Factory are pleased to present The Enclave, Richard Mosse's debut London solo exhibition. The Enclave, a multichannel video installation, was originally commissioned for the Irish Pavilion at the 55th Venice Biennale. The Enclave is the culmination of Mosse's work in eastern Democratic Republic of Congo. The installation will be accompanied by a presentation of large format photographic works. Mosse was drawn to eastern Congo because of the inherent problems of representing its cancerous cycle of war. Struck by the absence of a concrete trace of the conflict on the landscape, Mosse documented rebel enclaves and sites of human rights violations in a way which attempts to overturn traditional realism, and see beneath the surface. Using an extinct type of infrared film once employed by the military to detect camouflaged installations from the air, Mosse renders 'The Heart of Darkness' in irradiating Technicolor. With a significantly slower life than images constructed by photojournalism, Mosse's highly aesthetic approach considers problematic imagery from an oblique angle that strategically allows a different temporality in seeing. Mosse embraces the infrared medium's subtle shift in wavelength in an attempt to challenge documentary photography, and engage with the unseen, hidden and intangible aspects of eastern Congo's situation - a tragically overlooked conflict in which 5.4 million people have died of war related causes since 1998. To produce The Enclave, Mosse worked collaboratively with the cinematographer Trevor Tweeten to evolve a style of long tracking shot made with Steadicam, resulting in a spectral, disembodied gaze shot on 16mm infrared film. The piece's haunting, visceral soundscape is layered spatially by eleven point surround sound, composed by Ben Frost from recordings gathered in North and South Kivu. For Mosse's London exhibition, The Enclave has been expanded from six to eight double-sided screens, installed in a large darkened chamber creating a physically immersive experience. This disorienting and kaleidoscopic installation is intended to formally parallel eastern Congo's multifaceted conflict, confounding expectations and forcing the viewer to interact spatially from an array of differing viewpoints. The Enclave is an experiential environment that attempts to reconfigure the dictates of photojournalism and expanded video art. Mosse was born in 1980 in Ireland and is based in New York. He earned a Postgraduate Diploma in Fine Art from Goldsmiths, London in 2005 and an MFA in Photography from Yale School of Art in 2008. He currently has a solo exhibition at the Royal Hibernian Academy in Dublin, Ireland, which will travel to Ormston House Gallery, Limerick City, Ireland, and has upcoming solo exhibitions at FOAM, Amsterdam, the Netherlands; the University of New South Wales, Sydney, Australia; Fotomuseum, Antwerp, Belgium; Centro Atlántico de Arte Moderno, Canary Islands, Spain; the Vinyl Factory, London, England; and DHC/Art, Montreal, Canada. Forthcoming group shows include The Sensory War 1914-2014, Manchester Art Gallery, England; Landscape, Museo di Arte Moderna e Contemporanea di Trento, Italy; Counter Intelligence, Justina M. Barnicke Gallery, University of Toronto, Canada; and Contingency Plans, Shanghai Study Center, China. Mosse has been nominated for the prestigious Deutsche Boerse Prize and will be included in an exhibition of the short listed artists at the Photographer's Gallery, London, England in April, 2014, which will travel to Deutsche Boerse Headquarters, Frankfurt, Germany later that year. Mosse is a recipient of Yale's Poynter Fellowship in Journalism (2014), the B3 Award at the Frankfurt Biennale (2013), an ECAS Commission (2013), the Guggenheim Fellowship (2011), and a Leonore Annenberg Fellowship (2008-2010). Foreign Policy Magazine listed Mosse as a Leading Global Thinker of 2013. Mosse's most recent monograph, The Enclave, was published by Aperture Foundation in 2013 to accompany his presentation at the Venice Biennale.